What is this business called 'chaos'? What does it deal with? Why do people think it's important? And how did the term 'chaos' - long associated with disorder - come to signify a new paradigm in the orderly realm of mathematics? The concept of chaos is one of the most exciting and rapidly expanding research topics of recent decades. Chaos might underlie many kinds of well-known processes - the performance of the stock market, the weather, the cries of newborn babies, the dripping of a leaky faucet, and more.In "Chaos Theory Tamed", scientist Garnett P. Williams walks the reader through this exciting territory, building an understanding of chaos and its significance in our lives. "Chaos" is a mathematical subject. If you seek bodice-ripping romance, this book is not for you. But if you are a researcher working with data...a scientist, engineer, or economist who has specialized outside the field of mathematics...or an interested person with a bit of background in algebra and statistics...then "Chaos Theory Tamed" can help you understand the basic concepts of this relatively new arm of science.Williams explains the terms necessary for an understanding of chaos theory. He discusses 'sensitive dependence on initial conditions' and what that means for long-term predictions. He explores the role of the chaotic or 'strange' attractor, order within chaos, fractal structure, and the emerging concepts of self-organization and complexity. 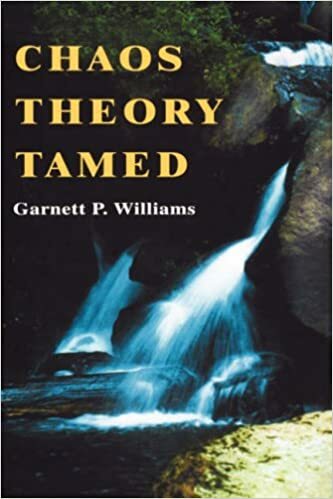 Drawing from mathematics, physics, and statistics, the book provides a toolkit for readers, including vectors, phase space, Fourier analysis, time-series analysis, and autocorrelation.Williams describes routes that systems may take from regular behavior to chaos - period doubling, intermittency, and quasiperiodicity - and discusses nonlinear equations that can give rise to chaos. Dimension is a basic ingredient of chaos, and Williams brings clarity to the many ways in which this term is used by specialists in the field. And he explains how the magnitude of chaos may be gauged by Lyapunov exponents, Kolmogorov-Sinai entropy, and mutual information - mysterious terms that 'aren't all that difficult once we pick them apart,' says Williams. "Chaos Theory Tamed" makes generous use of lists, graphs, field examples, summaries, and - perhaps most important - friendly language to help the reader learn and use the vocabulary of chaos. It will help scientists, students, and others outside mathematics to use the concepts of chaos in working with data, and it will give the interested lay reader a foothold on the fundamentals of this new realm of thought.